One bite of this prosciutto appetizer will surprise your taste buds with a flurry of flavors. Our Portland Specialist, Chef Jenn Louis of Lincoln created this delicious and flavorful citrus spread. Rosemary and Prosciutto di Parma sit atop creamy chevre cheese, giving this prosciutto appetizer both a savory and sweet flavor. It’ll be sure to please your guests on a hot summer night, when they’re craving refreshing flavors that pair perfectly with white wine. So what are you waiting for? Try out this delicious crostini to make this your best summer yet! 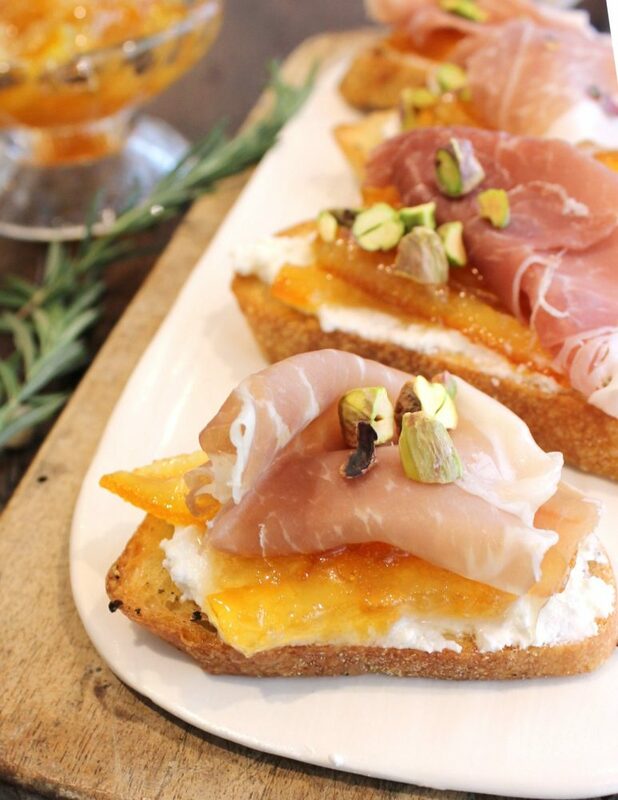 Take a look at this quick Prosciutto di Parma crostini how-to from Lucie Fink. Juice the citrus fruits; reserve the juice for another use. Cut the rinds into 1/4-inch thick slices. Cover with hot water; let stand for 4 hours or up to 24 hours. Drain. In a small saucepan combine 1 cup water, 1 cup of the sugar and 1 rosemary sprig. Bring to a simmer over medium heat. Remove from heat; set aside. To make marmalade, combine drained citrus fruit rinds, remaining sprig of rosemary and 1 3/4 cups water in a medium heavy saucepan. Bring to a boil; reduce heat. Let simmer stirring frequently, until the rind is very tender, about 1 hour. Watch carefully. Stir in remaining 1 1/3 cups sugar. Simmer gently stirring occasionally, until the mixture reaches 210° Fahrenheit, about 1 hour. Mixture will be thickened and rind will be translucent. Remove from heat and stir in some of the rosemary sugar syrup, a tablespoon at a time, until the mixture is the consistency of marmalade. Use remaining syrup for another use. Place bread slices on a large rimmed baking sheet. Brush both sides of each slice lightly with olive oil. Sprinkle with a pinch of salt and pepper. Bake until golden brown, about 15 minutes, turning once. Remove from oven; set aside. To prepare, spread each crostini with chevre cheese. Top with a spoonful of marmalade and add prosciutto with a pinch of pepper. For marmalade, feel free to use your own favorite brand if you aren’t up to making it from scratch.